This is old version KingRoot 4.9.2 apk for Android, you can install it if you want to downgrade or install old app. It is top Tools apps from KingRoot Studio. To begin using this app, user needs to download or descargar it first. Install the application on the Android. The next step is to open the app. In the application, there is one button to grant permission for rooting and a graphic showing the progress of rooting. Before clicking the root button, make sure the manufacturer and operating system is supported by KingRoot. Open System Setting and enable Device Administration by unknown source. After that, click the ‘Try to Root’ button in the bottom of the app. The rooting process will take time for a while, thus, make sure the battery level should be at least 20 percent. The device may reboot, and it is very common in rooting process. After the rooting is finished, application will show success message on the screen. Then, restart to save and apply the change. The advantages of KingRoot for Android as the root tool is that it does not cause memory loss. All data are save after rooting. It will not affect all data like contacts, pictures, music, and videos. It is very important user to enable Device Administration, otherwise, the application will not run due to the security layer run by System Administrator. To root directly from phone, the devices manufacturer should be supported. Unsupported device will get message to install KingRoot in PC and root from PC instead. Keep in mind that the three applications mentioned above; SU binary, King User, and King Master should be installed first. After the rooting process, King Master can be uninstalled, but King User cannot be uninstalled since it will unroot again. King Master comes in Chinese only and may be difficult for non-Chinese users to understand. However, the app can be replaced with the much popular SuperSU after the rooting process is complete. Sometimes a device which cannot bear the root process, or has software problem beforehand may experience bootloop. When bootloop happens, a device needs to be flashed. When a device is flashed, all data will lost unless users install a recovery tool. Seeing this, users should be very careful before rooting or device will end up in a mess. KingRoot is also available for PC. The PC version is for devices that are not supported . Recently, it has update an ability to root Sony devices after failed attempt on device to the logic implementation issue and Sony complicated security layer. After rooting, device can be customized by users. Users will have access to remove unremovable bloatware from manufacturer, customize the look of the device like the status bar and notification drop down menu. Users can also do memory partitions to manage memory, which is very beneficial for devices with low memory. Basically, rooting Android is like opening the gate to further explore the operating system, just like Jailbreak in Apple device. For Google or Nexus device which directly supervised by Google, rooting the phone will lose access for device to get software update using OTA since rooting violates the Google policy and security in Google devices. Keep in mind that rooting Android with any tool, including KingRoot will cause Warranty voids. Users will not be able to claim warranty since rooting violates the agreement in the warranty policy. Therefore, for new bought device, it is advisable not to root it first as to not lose the warranty in case there is something needs to be fixed from the device. Users are also recommended to search information about rooting advantages and disadvantages, especially when using this root tools. The fact that users can just root the devices in one click makes this application a great one since rooting needs different parameters depend on the chipset and additional security layer by manufacturer. 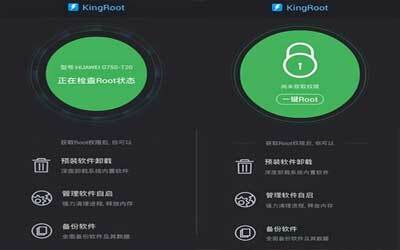 Overall, KingRoot for Android is a one-click root tools that support many devices and is simple to use, making it the universal root tool for Android. Obtain superuser privileges. By having rights SuperUser, you can do anything on Android, such as Custom ROM, edit android system and many others. You can Improve Performance Android. Can move applications from internal memory to SDCard. This is done when you have an android that has a small internal memory. To move an application to SDCard can use applications called Link2SD or Gemini App Manager and Application requires superuser rights. You become more Knowing about the Inside Android. Can install applications that require SuperUser Rights. Can remove the factory default application is not important which cause the batteries run out quickly.